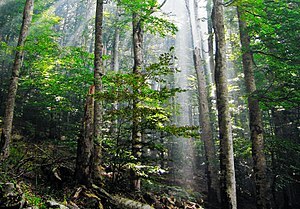 An old-growth forest — also termed primary forest or late seral forest — is a forest that has attained great age without significant disturbance and thereby exhibits unique ecological features and might be classified as a climax community. Old-growth features include diverse tree-related structures that provide diverse wildlife habitat that increases the biodiversity of the forested ecosystem. The concept of diverse tree structure includes multi-layered canopies and canopy gaps, greatly varying tree heights and diameters, and diverse tree species and classes and sizes of woody debris. Forest types have very different development patterns, natural disturbances and appearances. A Douglas-fir stand may grow for centuries without disturbance while an old-growth ponderosa pine forest requires frequent surface fires to reduce the shade-tolerant species and regenerate the canopy species. In the Boreal-West Forest Region, catastrophic disturbances like wildfires minimize opportunities for major accumulations of dead and downed woody material and other structural legacies associated with old growth conditions. Typical characteristics of old-growth forest include presence of older trees, minimal signs of human disturbance, mixed-age stands, presence of canopy openings due to tree falls, pit-and-mound topography, down wood in various stages of decay, standing snags (dead trees), multilayered canopies, intact soils, a healthy fungal ecosystem, and presence of indicator species. Old-growth forests are unique, usually having multiple horizontal layers of vegetation representing a variety of tree species, age classes, and sizes, as well as "pit and mound" soil shape with well-established fungal nets. Because old-growth forest is structurally diverse, it provides higher-diversity habitat than forests in other stages. 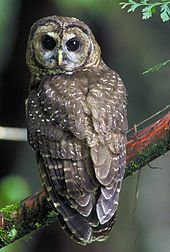 Thus, sometimes higher biological diversity can be sustained in old-growth forest, or at least a biodiversity that is different from other forest stages. The characteristic topography of much old-growth forest consists of pits and mounds. Mounds are caused by decaying fallen trees, and pits ( tree throws) by the roots pulled out of the ground when trees fall due to natural causes, including being pushed over by animals. Pits expose humus-poor, mineral-rich soil and often collect moisture and fallen leaves, forming a thick organic layer that is able to nurture certain types of organisms. Mounds provide a place free of leaf inundation and saturation, where other types of organisms thrive. Stand age can also be used to categorize forest as old-growth. For any given geographical area, the average time since disturbance until a forest reaches old-growth stage can be determined. This method is useful, because it allows quick and objective determination of forest stage. However, this definition does not provide explanation about forest function. It just gives a useful number to measure. So, some forests may be excluded from being categorized as old-growth even if they have old-growth attributes just because they are too young. Also, older forests can lack some old-growth attributes and be categorized as old-growth just because they are so old. The idea of using age is also problematic, because human activities can influence the forest in varied ways. For example, after logging of 30% of the trees, less time is needed for old-growth to come back than after removal of 80% of the trees. Although depending on the species logged, the forest that comes back after a 30% harvest may consist of proportionately less hardwood trees than a forest logged at 80% in which the light competition by less important tree species does not inhibit the regrowth of vital hardwoods. Tree species succession may change tree species' composition once the old-growth stage has been achieved. For example, an old boreal forest may contain some large aspen trees, which may die and be replaced by smaller balsam fir or black spruce. Consequently, the forest will switch back to understory reinitiation stage. Using the stand dynamincs definition, old-growth can be easily evaluated using structural attributes. However, in some forest ecosystems, this can lead to decisions regarding the preservation of unique stands or attributes that will disappear over the next few decades because of natural succession processes. Consequently, using stand dynamics to define old-growth forest is more accurate in forests where the species that constitute old-growth have long lifespans and succession is slow. The island of Tasmania, just off the southeast coast of Australia, has the largest amount of temperate old-growth rainforest reserves in Australia with around 1,239,000 hectares in total. While the local Regional Forest Agreement (RFA) was originally designed to protect much of this natural wealth, many of the RFA old-growth forests protected in Tasmania consist of trees of little use to the timber industry. RFA old-growth and high conservation value forests that contain species highly desirable to the forestry industry have been poorly reserved. Only 22% of Tasmania’s original tall-eucalypt forests managed by Forestry Tasmania have been reserved. Ten thousand hectares of tall-eucalypt RFA old-growth forest have been lost since 1996, predominantly as a result of industrial logging operations. In 2006, about 61,000 hectares of tall-eucalypt RFA old-growth forests remained unprotected. Recent logging attempts in the Upper Florentine Valley have sparked a series of protests and media attention over the arrests that have taken place in this area. Additionally, Gunns Limited, the primary forestry contractor in Tasmania, has been under recent criticism by political and environmental groups over its practice of woodchipping timber harvested from old-growth forests. The increased understanding of forest dynamics in the late 20th century has led the scientific community to identify a need to inventory, understand, manage, and conserve representative examples of old-growth forests with their associated characteristics and values. The literature around old growth and its management is inconclusive about the best way to capture the true essence of an old-growth stand. Less than 3% in Europe, where more than 150 km2 of intact forest landscapes are cleared every year and the last areas of the region’s intact forest landscapes in European Russia are shrinking rapidly. In the United Kingdom, they are known as ancient woodlands. ^ Luyssaert, S; Schulze, ED (2008). "Old-growth forests as global carbon sinks". Nature. 455 (7210): 213–5. doi: 10.1038/nature07276. PMID 18784722. ^ McGarvey, Jennifer; Thompson, Jonathan R.; Epstein, Howard E.; Shugart, Herman H. (2015-02-01). "Carbon storage in old-growth forests of the Mid-Atlantic: toward better understanding the eastern forest carbon sink". Ecology. 96 (2): 311–317. doi: 10.1890/14-1154.1. ISSN 1939-9170. ^ Keith, Heather; Mackey, Brendan G.; Lindenmayer, David B. (2009-07-14). "Re-evaluation of forest biomass carbon stocks and lessons from the world's most carbon-dense forests". Proceedings of the National Academy of Sciences. 106 (28): 11635–11640. doi: 10.1073/pnas.0901970106. ISSN 0027-8424. PMC 2701447. PMID 19553199. ^ Zhang, J.; Smith, K. R. (2007). "Household Air Pollution from Coal and Biomass Fuels in China: Measurements, Health Impacts, and Interventions". Environmental Health Perspectives. 115 (6): 848–855. doi: 10.1289/ehp.9479. PMC 1892127. PMID 17589590. ^ "Announcement". Archives of Virology. 130 (1–2): 225. 1993. doi: 10.1007/BF01319012. ^ Dai, Limin; Jia, Juan; Yu, Dapao; Lewis, Bernard J.; Zhou, Li; Zhou, Wangming; Zhao, Wei; Jiang, Linhai (2013-07-15). "Effects of climate change on biomass carbon sequestration in old-growth forest ecosystems on Changbai Mountain in Northeast China". Forest Ecology and Management. Shaping Forest Management to Climate Change. 300: 106–116. doi: 10.1016/j.foreco.2012.06.046. ^ van der Sande, Masha T.; Arets, Eric J. M. M.; Peña-Claros, Marielos; de Avila, Angela Luciana; Roopsind, Anand; Mazzei, Lucas; Ascarrunz, Nataly; Finegan, Bryan; Alarcón, Alfredo (2016-05-01). "Old-growth Neotropical forests are shifting in species and trait composition". Ecological Monographs. 86 (2): 228–243. doi: 10.1890/15-1815.1. ISSN 1557-7015.